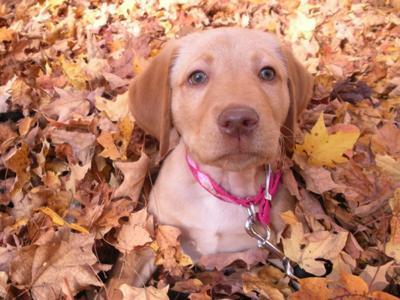 Every one of these yellow lab puppy pictures is adorable, and it's not difficult to see why this breed is consistently one of the most popular. 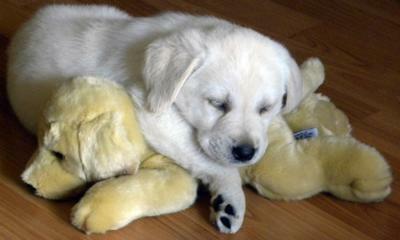 The Yellow Labrador Retriever is probably the most easily recognized, and the most popular, variety of this breed. I'd doubt that there are many people who wouldn't recognize one! 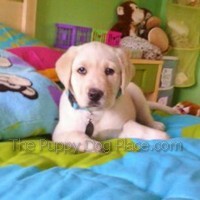 Labrador Retrievers have held the #1 spot among the most popular dog breeds for the last 20 years and rightly so. 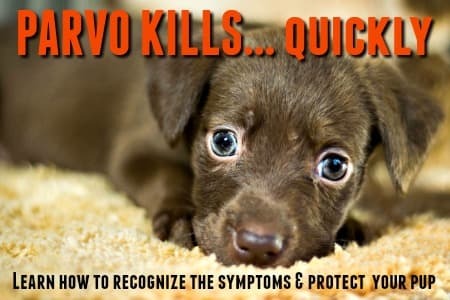 When it comes to being photographed, they're also probably one of the most commonly-seen breeds and pictures of Lab puppies are used to advertise all sorts of things from toilet paper to flea medications. The very earliest Labs were all black, but in 1899 the first recognized and registered yellow lab puppy was born in England. His name was 'Ben of Hyde' (you can see his photo further down the page, it's the only black-and-white one!). At this time though that yellow coat color was in fact referred to as 'gold' and the dogs themselves as 'Golden Labradors'. This is because they actually were much more golden in color than they were yellow... deep caramel color really. 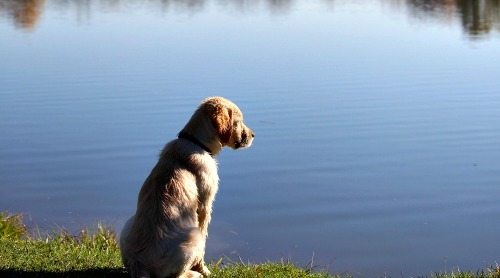 When I was a very little girl our family dog was one of these dogs and she was a beauty. Today's yellow labrador retriever's coat can be anywhere from a deep Fox Red (similar to the original golden color), through various shades of gold and yellow, all the way to the palest cream and even white. 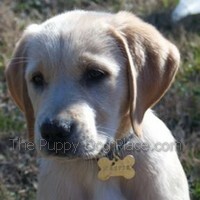 The three pictures above show lab puppies with the gold colored coats. The ones just below are lighter, more of a cream. Although the their coat can be any shade between white and red, the pigment color of their nose, paw leather & eye rims should be black, and their eyes should be brown (according to the AKC Breed Standard). 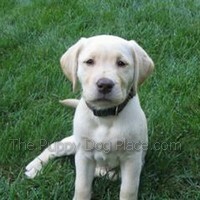 It's also not unusual to see yellow labradors with brown noses or eye-rims/paw leather. Overall they do have a genetic predisposition towards pigment problems and anomalies, caused by recessive (or even faulty) genes, and because of the complicated way in which the 'color' genes interact, there's a wide variety of possible coat/skin color combinations. 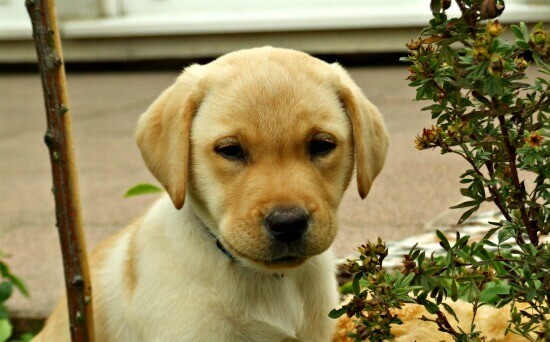 Labrador Retrievers are the ultimate all-round 'good guy', and so versatile that they're suitable for just about every family, home, lifestyle and environment. 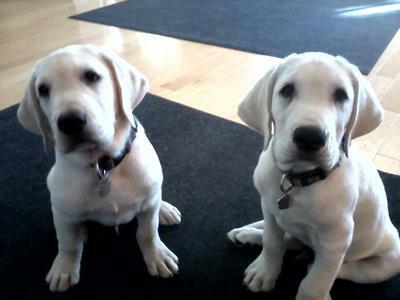 They love water, enjoy hikes and hunting, are smart, loving and so very eager to please. 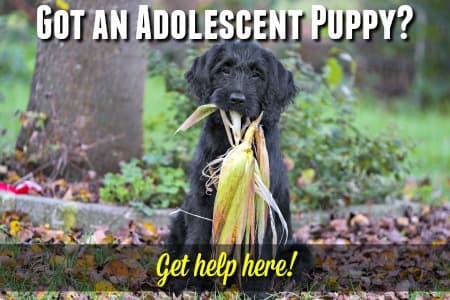 Each color has their own slightly individual temperaments, but every single puppy or dog is unique and you need to look to the parents for personality, conformation, genes etc. Coat color is as much about personal preference as anything else, and I think they're all equally stunning in their own way. 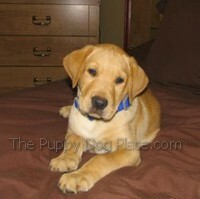 To learn more about the breed in general, check out my The Labrador Retriever page. 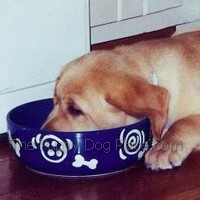 You can also see more adorable photos on my Lab Puppy Photos, Black Lab Puppy Pictures and Chocolate Lab Puppy Pictures pages. No matter which variation of coat color you choose, your won't be disappointed! 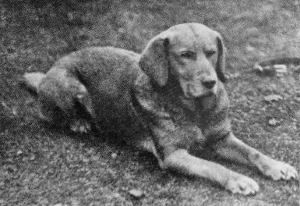 And last but not least, this photo above is of the very first recognized Yellow Labrador Retreiver, known as 'Ben of Hyde'. Interesting isn't it?